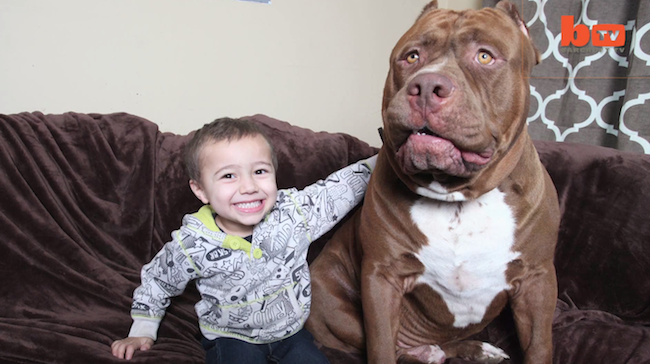 Have you heard about Hulk the pit bull? The story of this 175-pound gentle giant went viral last week and has everyone talking about this misunderstood breed. What’s the low-down? “Pits” are often depicted by the media as aggressive and dangerous pets; for decades, they have been selectively bred for illegal dogfighting, leading to overpopulation and crowded animal shelters. Yet pits have a passionate, loyal following of people like Hulk’s owners, who are committed to raising awareness of the breed and ending negative stereotypes. In fact, “pit bull” is an umbrella term that refers to several breeds—American Pit Bull Terrier, American Staffordshire Terrier, and Staffordshire Bull Terrier—along with many pit mixes. Just like all terriers (think Jack Russells or Bostons), pits are very high-energy and fearless; they love activities and aim to please. They’re also extraordinarily strong, agile, and larger than most other terriers, which helps explain why they’ve been singled out for fights. As with all pets, these characteristics are largely what you make of them. Dogs especially are always trying to learn to be what their masters want, so in the hands of cruel breeders and dogfighters, they’re taught (or forced) to be aggressive. Far more importantly, these sweet and devoted pups thrive in the loving, attentive homes that give them the care, training, and exercise they need. At Pampered Pets, we welcome all pit bulls with open arms and a boundless energy to match theirs. Let’s play!